In this month’s Harvard Buiness Review, Jordan Etkin and Cassie Mogilner take a look at one of my favorite pet peeves, multitasking. Years ago, when I was involved in the hiring process and actually read resumes, (we have a much more sophisticated system for seeking out great talent now) nearly every applicant listed the word “multitasking” as a job strength. If you’ve hung around me for long, you know that multitasking was a term developed to describe what computer chips can do during a single cycle and was never meant to be applied to human resources. Unfortunately, everyone thinks multitasking is a great strength. The ability to answer the phone, check email, interact with a customer and file paperwork “all at the same time” is seen as a lofty goal towards which we should all aspire. Nevermind the fact that it’s a complete load of B.S. You cannot multitask. Period. You can switch task, meaning that you can divert your attention away from the task at hand for short periods of time and come back to the previous task. Problem is, this type of work environment leads to distraction, wasted time, errors and eventual burn out. 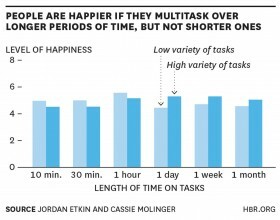 Research conducted by Etkin and Mogilner confirm, unless you’re talking about long periods of time (like weeks or months), higher variation in the task at hand actually leads to less satisfaction at work. Their research provides a framework for how work time should be scheduled to increase productivity and emplpyee happiness. Give your team members a variety of projects over the long-term but do not overload them with lots of different tasks in the short term. Let your clinical team focus on the clinic during the day. Throughout the month and quarter, give them projects that can enhance their happiness by varying the task at hand. You might put them in charge of an inventory project on a non-clinic day or send them out into the community to run a health fair. Whatever you do, don’t give them 10 minutes in the clinic then 25 minutes filing paperwork then 5 minutes checking mail, then 2 minutes fixing the sterilizer, then another 10 minutes back in the clinic. The short-term multitasking environment is not only unproductive but it leads to employee unhappiness.